Viator is the leading online provider of destination travel products: sightseeing tours, theater tickets, attraction passes, theme parks, even private and custom experiences. All the things you do when you get to your destination. Their selection of products includes 5,000+ tours and attractions, in over 450 destinations worldwide. Viator is the traveler's one-stop-shop for researching, planning,and booking destination activities that meet a variety of tastes and preferences. Check 58Coupons.com for the latest Viator.com discounts, Viator.com promotions and Viator.com coupons available for Viator.com. 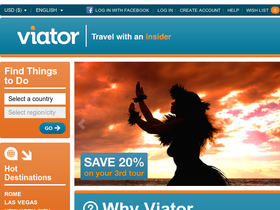 Viator.com offers discount tours, activities and attractions discounted up to 50% for over 450 destinations. Check out this incredible deal from Viator.com take the Toronto Inner Harbour & Island Cruise under $30. Click link code for all the details. For a limited time you can enjoy Italian wine and cheese tasting in Florence from just $40.72 when you book with Viator. Follow this link for details. Click link to take advantage of this great deal -- NYC Harbor Lights Cruise for just $31.99 on Viator.com. Traveling to Venice, Italy? Get $9 Off Venice in One Day - The Original Venice Walk and Grand Canal Boat Tour at Viator. Get on over to Viator to save 25% on Grand Canyon All American Helicopter Flight. Click link code to go there now!